The Dubai Health Authority (DHA) plans to open an oncology and research centre in Dubai by 2020, aiming to provide state-of-the art oncological services for all types of cancer and across all age groups under one roof. Humaid Al Qutami, director general of the DHA said that in the first phase, the centre will cater to 700 patients, which is 35 per cent of the total number of diagnosed cancer patients in Dubai. He added that this percentage will increase by four per cent every year until it reaches 4,000 patients by the year 2027. 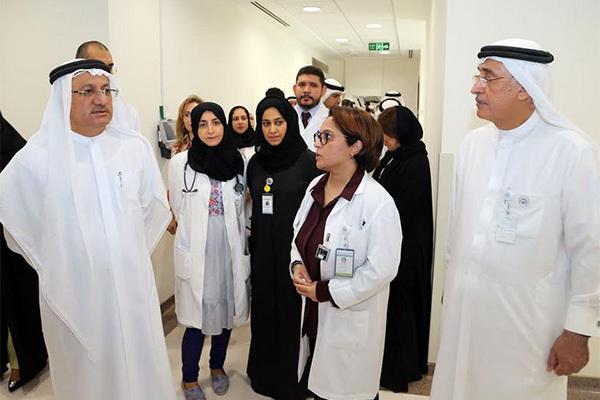 Al Qutami made the announcement during his visit to Dubai Hospital to inspect the centre’s progress. He revealed that while the centre will be diagnosing and treating all types of cancers, in the first phase it will focus on four types of cancer: breast cancer, colon cancer, lung cancer and prostate cancer. During his visit, specialized doctors provided an overview of the lasted progress of the centre. They highlighted that the establishment of an oncology and research centre in Dubai is greatly needed as cancer is the third most common cause of death in the UAE. Between 2015 and 2017, the number of new registered cancer cases by Dubai Hospital was 2010, out of which 53 per cent were women and 47 per cent were men. Furthermore, they revealed that the top 10 most common cancers respectively at Dubai Hospital from 2015 to 2017 were hematologic cancers, breast cancer, colorectal, thyroid, lymph nodes, bronchus, uterus, brain, stomach and bladder cancer. The new cancer centre of excellence will provide multi-specialised cancer treatment for UAE residents and medical tourists seeking treatment in Dubai. Along with the launch of the centre, the DHA will also be putting in place strategic plans to decrease the prevalence of cancer, ensure early detection, provide quality diagnostic and treatment services and raise awareness about the disease. The centre will focus on providing specialised cancer research, creating a cancer patient database, promoting local and international collaborations in the field, utilizing the best technology in the field and launching high-standard cancer training programs that are at par with international standards. Al Qutami said the centre is one of the authorities many developmental projects that aim to enhance Dubai’s health system to provide quality services and subservices to the people of Dubai and put the city on the map as a leading destination for medical tourism. Al Qutami also said that the centre will begin providing its services in 2020 in cooperation with international bodies that are specialized in the field of cancer treatment and diagnosis. He added that the centre will be equipped with the latest state-of-the-art technologies and specialized medical cadres.